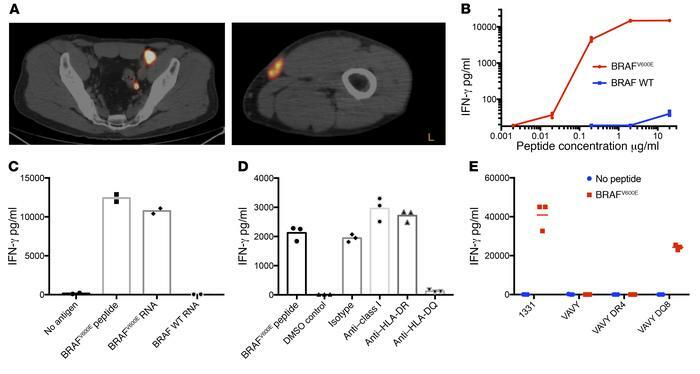 CD4+ T cells specific for BRAFV600E isolated from post–TIL infusion PBMCs are restricted by HLA DQB1*03. (A) Positron emission tomography showing recurrent tumor in left iliac region (left) and left thigh (right). (B–D) Specificity and HLA restriction of BRAFV600E-specific T cells. (B) IFN-γ production by a patient-derived T cell line incubated with autologous B cells pulsed with WT and mutant BRAF peptide. (C) Recognition of autologous B cells transfected with mRNA encoding mutant or WT BRAF sequences. (D) Recognition of autologous B cells pulsed with mutated BRAF peptide in the presence or absence of HLA blocking antibodies. (E) BRAF-specific CD4+ T cell recognition of the B-LCL line 1331 (DR0404, DQA1*0301/DQB1*0302), which is matched at HLA-DQ with the patient, and the HLA-DQ-mismatched B-LCL line VAVY (DR3, DQA1*0501/DQB1*0201) prior to and after transduction with HLA-DRB1*0404 (DR4) or HLA-DQB1*0302/DQA1*0301 (DQ8). Assays were performed with and without pulsing with BRAFV600E peptide. Experiments were performed with 2–3 technical replicates.